Among various ko-Kutani ware are large dishes of over 30cm in diamter. This is a well-known example of one the largest dishes of ko-Kutani ware with a design unique to this piece. The dish, of a gray white porcelain clay, is very thinly potted. 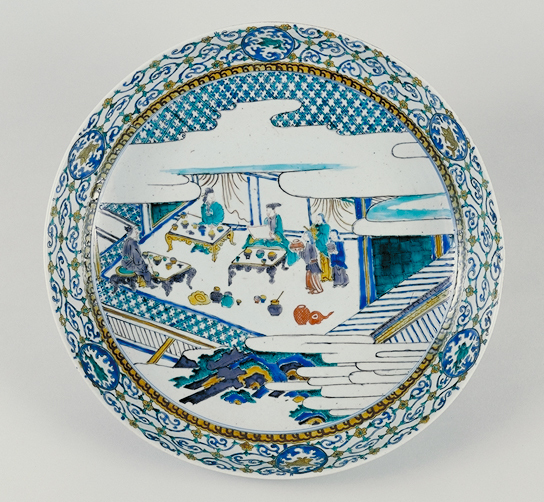 It features delicate scrollwork around the perimeter, and is decorated on the interior surface with a Chinese banquet scene shown from a bird's-eye perspective as if through an open roof, with mists above and below.